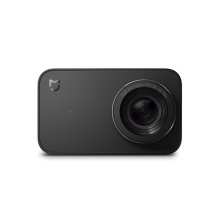 The Global Version Xiaomi Mijia Mini Camera is features a 2.4-inch touchscreen, with 7 glass lens and advanced chipset, it supports 4K 30fps video recorded. The six-axis EIS is more stable for shooting high-quality images. Supports 4K 30fps video recorded, 4K is delivered in smooth 30fps but you can also shoot at 3840x2160P resolution with faster frame rate. 145°Wide Angle, F/2.8 Aperture, wide shooting vision for capturing more amazing perspectives. The Mijia 4K camera houses a removable 1450 mAh battery, quite large compared to other cameras. Adopt for advanced Ambarella processor supports H.264 encoder and image sensor pipeline(ISP) integrated. A low dispersion lens contained , with additional UV coated IR filter, the camera is access to high-quality images. Built in 3-axis accelerometer and 3-axis gyroscope and BMI 160 IMU software, the Mijia camera ensures steady final footage. It features a 2.4-inch touchscreen for simple access to the photo gallery and video recording. Including Time Lapse Video/ Slow Motion/ Timed Photo/ Burst Photo & so on. 1.Memory card is not included. 2. The language only supports Chinese and English.